Other Common Names: Common yarrow, carpenter’s weed, knight’s milfoil, noble yarrow, old man’s pepper, nosebleed, staunchgrass, soldier’s woundwort, sanguinary, devil’s nettle, devil’s plaything, bad man’s plaything, yarroway, herb militaris, thousand leaf, thousand seal, field hop, millefolium, ladies’mantle, gandana, i-chi-kao, gearwe, yerw. Habitat: Yarrow is a hardy perennial that is native to Eurasia and widely naturalized in the United States. There is some debate as to whether the herb is circumpolar; that is, whether it is native throughout the temperate regions of the world. There are a related species found in America known as wooly and/or western yarrow (Achillea lanulosa). Yarrow can be found in waste areas, edges of railway tracks, lawns, grassy areas, old fields, along fence lines, roadsides, and other edges. It does well in a nutrient poor soil as long as it is well-drained. It prefers full sun but will tolerate partial shade. 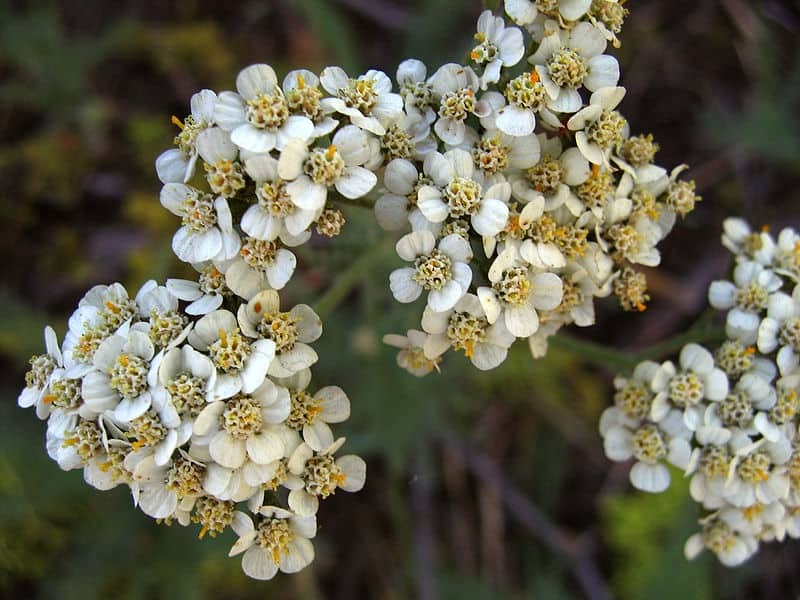 Yarrow is drought-resistant; however, it is susceptible to mildew and rust. It is generally free of disease and insect predation. Plant Description: Achillea millefolium is a very hardy perennial that in the early springtime sends up a rosette of long, feathery, stalked leaves. The stem is angular and rough with leaves that are alternate, 3 to 4 inches long and 1 inch wide, clasping the stem. The leaves are bi-pinnatifid, the finely cut segments giving the herb a feathery look (hence the common name “thousand leaves”). A fuzzy, hairy flower stalk appears later in the season, with shorter, alternate, unstalked leaves that may be rather sparse. Yarrow is pleasantly aromatic, flowering early summer through early fall with white, or sometimes pink, flat-topped clusters. The flowers are about a quarter-inch in diameter, with four to six, but generally five ray flowers with three teeth at their tip. The ray flowers are usually wider than they are long and surround many little disk-like flowers. Yarrow blooms for a long time, eventually producing seed heads that remain standing throughout the winter. The basal leaves often persist through winter and may still show green when the snow melts in springtime. Plant Part Used: Arial parts; stems, leaves and flower. The primary external actions of this herb are styptic (stops bleeding), astringent (makes tissue contract), antiseptic (inhibits bacterial growth), vulnerary (helps tissue heal), anti-inflammatory and possibly anesthetic. Internally, yarrow is diaphoretic (raises the body temperature and induces sweat), expectorant, carminative (dispels gas), hemostatic (stops bleeding), astringent, antibiotic, anti-inflammatory, antispasmodic, analgesic, stimulant, and emmenagogue. It also makes a bitter tonic that stimulates digestion. Over 3,000 years ago, ancient Greeks used it as a treatment for wounds. 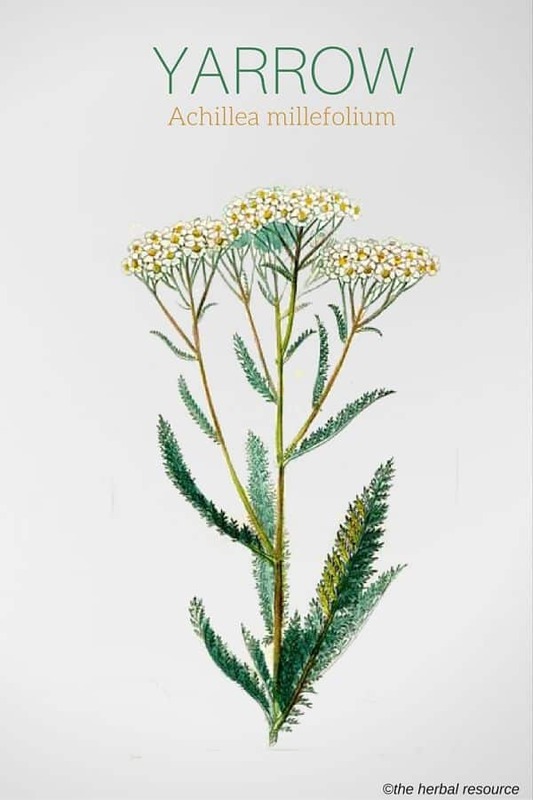 The genus name, Achillea, honors the Greek hero Achilles; who reportedly used yarrow for himself and for his soldiers as a treatment for battle wounds. Yarrow is a traditional woman’s herb, used to ease menstruation. Many herbal sources regard it as a uterine tonic. A number of studies have supported the use of it to enhance circulation to the uterus, improving the tone, increasing menstrual flow and reducing uterine spasms and menstrual cramps. 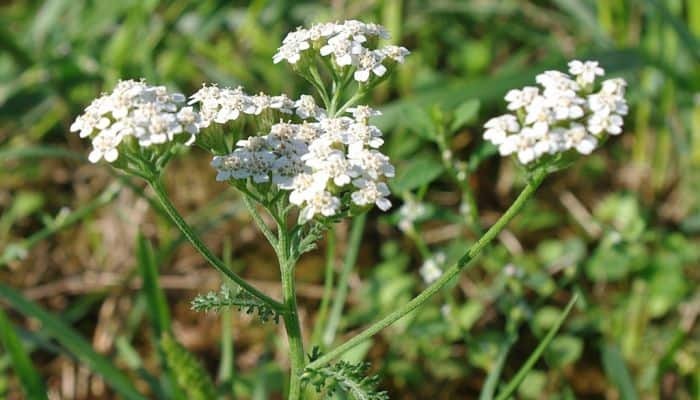 Traditional herbalists recommend Achillea millefolium as a natural treatment for menorrhagia, amenorrhea, uterine hemorrhages, and leucorrhea. As a medicinal plant it is believed to be an effective herbal antiseptic; in Scotland, a wound ointment is made from it. An ointment made from it is also used as a treatment for piles (hemorrhoids). The bitter qualities and fatty acids encourage bile flow (known as the cholagogue effect), improving digestion and preventing the formation of gallstones. Yarrow is used as a natural decongestant and expectorant having an astringent action that is useful in treating nasal congestion due to colds and allergies caused by molds, dust, pollen, and dander. Skin conditions such as eczema are treated with an infusion of yarrow. Yarrow is used as a natural anti-inflammatory in the treatment of arthritis and rheumatism. The volatile oil is rich in sesquiterpene lactones, and alkamides giving yarrow its anti-inflammatory activity. The presence of the alkamides may also further reduce inflammation. Herbalists consider Achillea millefolium to be one of the best diaphoretic herbs; it is a standard herbal remedy for the treatment of fever. For a natural treatment for fever, yarrow combines well with elder flower, peppermint, boneset, cayenne and ginger. It lowers blood pressure due to dilation of the peripheral vessels and herbalists consider it to be specific in treating thrombotic conditions associated with hypertension. For a natural herbal treatment for high blood pressure the herb combines well with hawthorn, linden flowers and European mistletoe. The alkaloids in yarrow act as a hemostatic (an agent used to stop internal bleeding) and it is used as an herbal treatment to curb hemorrhages. Herbalists use yarrow as a natural digestive aid; it stimulates the secretion of enzymes and digestive juices, improving appetite and helping with digestion. Its astringent action makes it a useful natural treatment for diarrhea and dysentery. It is used as an herbal remedy to relieve the symptoms of cystitis (a bladder infection marked by pain as well as frequent, painful urination). Yarrow may be used as a natural herbal stimulant for the circulatory system, and as a treatment for varicose veins, hemorrhoids, phlebitis (inflammation of superficial veins that results in pain) and thrombosis. Yarrow flowers – 3 g per day as a tea or infusion. Extract (1:1, 25 ethanol) – 1 to 4 ml three times a day. Dried herb – 2 to 4 g of infusion or yarrow capsules three times a day. Tincture (1:5; 40 ethanol) – two to four times a day. Yarrow should be collected and used with respect and used sparingly. Extended or excessive use, whether internally or externally, may cause photosensitivity or allergic reactions. Handling the plant gives some people a rash. Wood, Matthew: The Book of Herbal Wisdom. Using Plants as Medicines. Berkeley, California. North Atlantic Books 1997. Barton, Anna M., Elizabeth Collins & Nancy Berkoff: Natural Treatments for Colds and Flus. Roseville, California. Prima Health 1999. Barnes, Joanne; Linda A. Anderson & J. David Phillipson: Herbal Medicines. A guide for healthcare professionals. 2nd Ed. London. Pharmaceutical Press 2002.